Most people don’t like the same things, like Marmite or marzipan they divide opinions; but there is one flavour you always seem to be able to rely on as a crowd pleaser and that is chocolate orange. Just the smell of it makes me think of Christmas and for me its a happy memory. I love to buy a Terry’s Chocolate Orange and then eat it in bed on a Saturday morning over Christmas, the best bit is the middle stick after you’ve eaten the segments. Mmm. I wanted to make some cakes for my cousin and thought instead of the standard vanilla I would make chocolate orange ones. Its a really easy recipe to do but looks and tastes really good. I decided to use some Nutella in the buttercream icing to make it more chocolatey and it worked very well. For the icing – a very large tablespoon of margarine mixed with 3-4 tablespoons of icing sugar and 1 level tablespoon of cocoa powder. Once this has been mixed together till it is very light add a tablespoon of Nutella and a teaspoon of orange essence. In a large mixing bowl, beat the margarine and sugar together till it becomes pale. In a separate bowl combine the flour and cocoa powder. Add one egg and a third of the flour and cocoa powder then mix in till just combined. Do the same with the 2nd egg and flour and cocoa powder. Stir in the remaining flour along with the orange essence and chocolate chips. You want the consistency to be a little thick but easy to stir. If it looks a little dry add a small drop of milk. Separate into cake cases and bake in the oven for at least 20 minutes, or until you can press the top of the cakes and they spring back up. Once cool, top with the chocolate buttercream and decorate how you like. I used gold glitter and a jelly orange slice. Next postHappy Birthday Sis: Frozen Raspberry and White Chocolate Cheesecake. 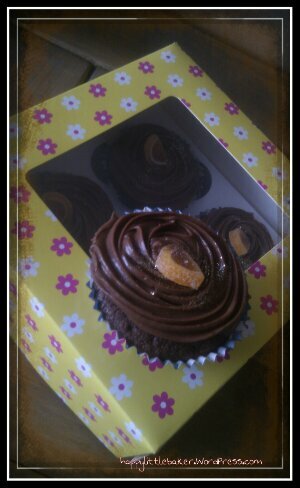 You’re totally correct – choc orange rules! These look delish. Got to love chocolate orange!